YALE 6000 LB LPG FORKLIFT WITH 6FT FORKS. STRYCO 60 KVA AND ACME 20 KVA SPOT WELDERS. PEM SERTER SERIES 4 INSERTION PRESS AND PNEUMATIC C FRAME PRESS. LINDE UCC –305 TIG WELDER. STRIPPIT SUPER 30 SINGLE END PUNCH WITH 3.5’’ ROUND HOLDER, 2’’ UNIVERSAL NOTCHER, 1.25’’ STD HOLDER, AND STILLUS. STRIPPIT FC-750 CNC TURRET PUNCH WITH HECC-80 CONTROL, 20 STATION TURRET, 30 TON CAPACITY, 66 X 77 BALL TRANSFER TABLE. 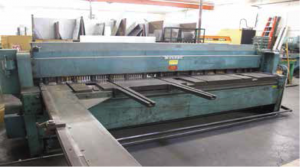 CHICAGO MODEL 56-A, 6FT X 45 TON MECHANICAL PRESS BRAKE, WITH POWER RAMADJUSTMENT, S/N 12777. PARTIAL VIEW OF PRESS BRAKE FORMING DIES. CHICAGO 1012-L, 12FT X 90 TON MECHANICAL PRESS BRAKE WITH DYNABEND CNC CONTROL, POWER RAM ADJUSTMENT, S/N L-19471. AMADA CS-220, 10 GA HYDRAULIC CORNER NOTCHER. HEBERLE H350, 14’’ COLD SAW. AEM 25’’ SHEET METAL GRANER WITH DUST COLLECTION SYSTEM, MODEL MBS-250, STRIPPIT DIE GRINDER. CURTIS 10 HP AIR COMPRESSOR. WHITNEY JENSEN MODEL 120 PUNCH.